crown cap zap cap bottle openers. Removes crown caps and twist off lids with a simple punch. New design with molded crown cap top feature. Built in magnet for easy disposal of metal bottle tops. An original design registered product. Zap Cap is The World's Greatest Bottle Opener! Zap Cap bottle openers work on any crown cap, even twist off! Beer and soda. 1) Set Zap Cap bottle opener on the bottle. The magnet holds the cap. 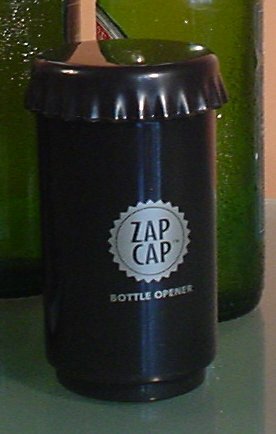 Zap Cap bottle openers are an ingenious new invention which removes all crown caps, even twist offs, with a simple punch. Zap Cap bottle openers. Ideal for bars, restaurants and home, gifts . Like magic the cap pops off and is held in place by a special magnet for easy disposal. Zap Cap bottle openers are quite clearly "The World's Greatest Bottle Openers!" WEARY OF WRESTLING WITH BOTTLE CAPS? Hands, both young and old, often find it difficult to remove the stubborn crown and twist caps found on beer, soda, water and juices. Using a conventional bottle opener can prove cumbersome and frustrating. Well, all that will now come to an end. Zap Cap bottle openers easily, and almost by magic, remove crown and twist caps with a simple punch of the hand. You'll never have to struggle with your old bottle opener again! Zap Cap bottle openers are both fun and easy to use. 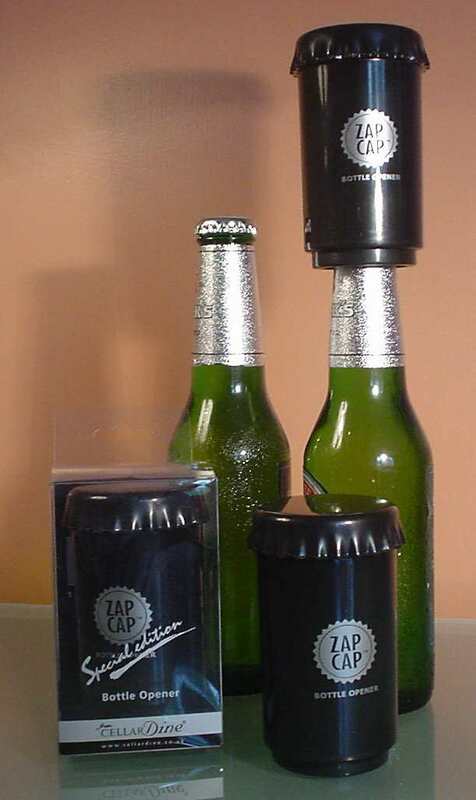 Simply set a Zap Cap bottle opener atop your bottle, then, while recalling all those frustrated moments you've had trying to remove those stubborn twist and crown caps by hand, give ZapCap bottle opener one good punch down and voila -- soda anyone? Get one of these Zap Cap bottle openers today. world cup zap cap bottle openers. nutcracker bottle opener, Nutcracker Bottle Opener, nutcracker bottle opener, kitchenware. crown cap zap cap bottle openers text, images and video are copyright.